Questtec Direct-Reading Level Gauges are a simple and reliable way to determine the level of liquid in a tank or vessel, because they give you a direct view without compromising the integrity of your process system. Questtec level gauges operate such that the liquid level in the transparent sight tube is always the same as the liquid level inside the tank or vessel. Questtec Armored Tubular level gauges can be used at operating pressures up to 285 psig. For higher operating pressures, use Questtec’s Magne-Trac Magnetic Level Indicator, Steam-Trac, or Glass-Trac Gauges. High-purity for 3A and FDA applications available. All Questtec Armored Tubular Level Gauges incorporate PTFE Teflon® Max-Seal inserts, which seal on the outside diameter of the glass sight tube, not the ends of the sight tube. Since Max-Seal inserts allow sight tube movement without leaking, stresses caused by differential expansion between the sight tube and the housing are eliminated. There are no elastomer seals or O-rings to inspect and replace. Max-Seal inserts are resistant to most chemicals and have a long life span. Single-section model QST and QDT level gauges are easy to install because they are shipped fully assembled. 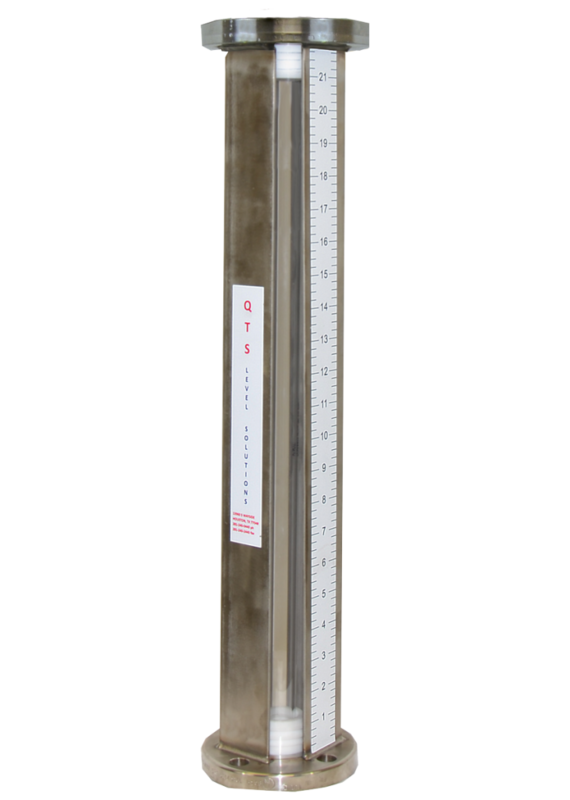 Questtec QST level gauges are available in lengths up to 12.5 feet with glass sight tubes and up to 20.0 feet in polycarbonate or acrylic sight tubes, so there are no staggered assemblies or complex piping arrangements as with conventional multi-section level gauges. Single-section models QDT are available in lengths up to 10.0 feet depending on the choice of inner and outer sight tubes.